Dental amalgam, sometimes referred to as “silver filling,” is a silver-colored material used to fill (restore) teeth that have cavities. Dental amalgam is made of two nearly equal parts: liquid mercury and a powder containing silver, tin, copper, zinc and other metals. Amalgam is one of the most commonly used tooth fillings, and is considered to be a safe, sound, and effective treatment for tooth decay. 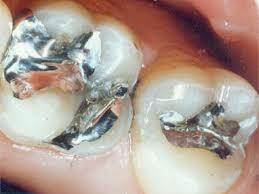 When amalgam fillings are placed in or removed from teeth, they can release a small amount of mercury vapor. Amalgam can also release small amounts of mercury vapor during chewing, and people can absorb these vapors by inhaling or ingesting them. High levels of mercury vapor exposure are associated with adverse effects in the brain and the kidneys. Since the 1990s, several federal agencies have reviewed the scientific literature looking for links between dental amalgam and health problems. According to the Centers for Disease Control and Prevention (CDC), there is little scientific evidence that the health of the vast majority of people with dental amalgam is compromised, nor that removing amalgam fillings has any beneficial effect on health.